Added on 28 January 2019 . By Olivia Cheves. Following a fleet of new openings in Camden Market, rotisserie spot Kuku Riku is the latest restaurant to find a home in the area. Taking over the site formerly held by Voodoo Ray's, and the antique shop next door, the eatery specialises in 24-hour marinated rotisserie chicken, cooked over their Josper charcoal grill which takes centre stage in their open kitchen. And if you're looking to dig into this juicy chicken, you'd better grab some sides to go with it, including roasted hasselback potatoes, buttermilk onion rings and 'The Ultimate Mac 'N' Cheese', which boasts Stilton, parmesan and Barbour's cheddar. 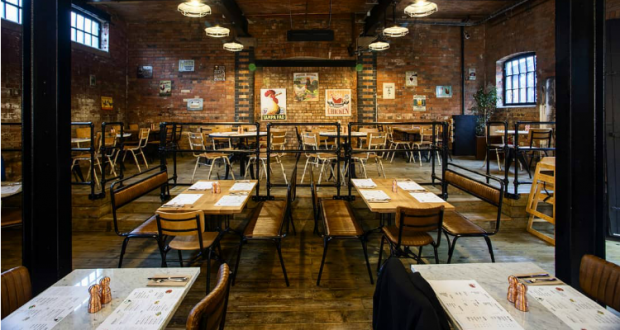 The interiors are perfect for a casual bit to eat in between perusing the market stalls, with with exposed brick and wooden tables making the vast industrial space all the more inviting.